In less than 30 years the city of Dubai has transformed into prosperous city that reaches for the sky. Now famous for its world-firsts and impressive skylines, Dubai’s dynamic architecture is evident before you even land at the airport. The modern architecture here is unlike anywhere else in the world. So much so that Dubai has taken over Hong Kong and New York City as the tallest city in the world! Whether you prefer dazzling, ultra-modern designs or authentic classical designs, Dubai’s diverse city skyline is sure to impress. Here’s our top picks for architectural wonders in Dubai! 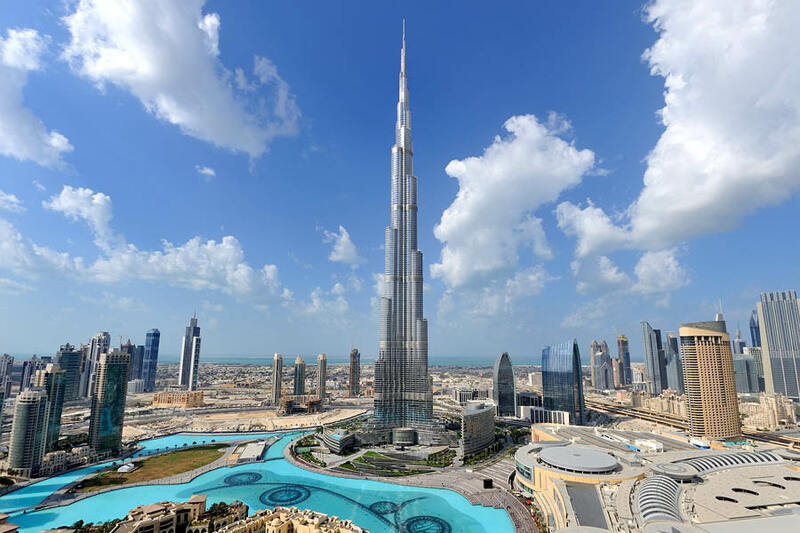 Soaring more than 820 metres in the sky the Burj Khalifa is by far the most impressive piece of architecture in Dubai. The awe-inspiring building consists of more than 160 stories giving Burj Khalifa the record for the tallest building and free standing structure in the world. Not only that but this incredible work of art holds the records for the highest occupied floor and highest outdoor observation deck in the world! The Burj Khalifa experience begins when you embark the journey to the top of the building. The entire upward journey is an educational experience with projections and interactive experiences telling the story of Burj Khalifa and the vision of Dubai. Stop at Levels 124 & 125 for floor to ceiling windows providing 360° views of Dubai. There are advanced telescopes on these levels to get a better look of the city of Dubai. A special elevator will transport you to the highest outdoor observation deck on level 148. 555 metres above the ground the views from here are indescribable. Make sure you take your camera because this is an experience you will want to look back on forever! 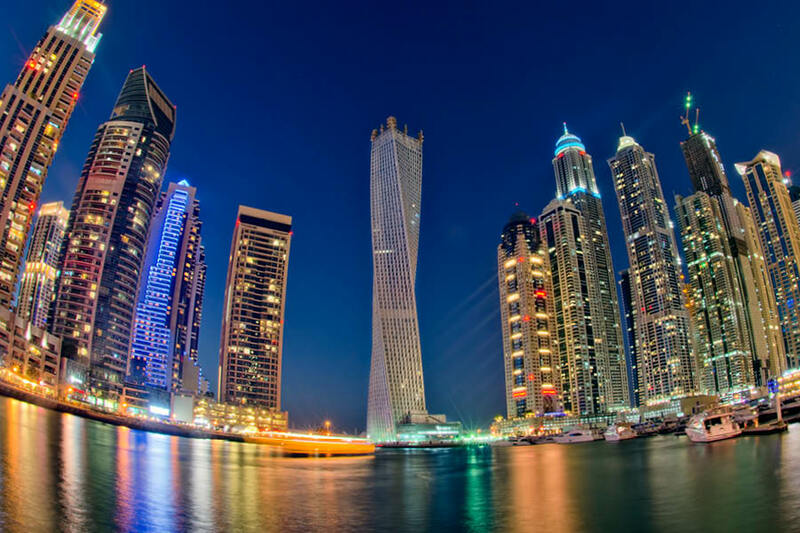 Located in Dubai Marina and soaring over 300m high the Cayan Tower is an incredibly unique building. Formerly the Infinity Tower, the Cayan Tower has a 90° twist throughout the entire building. Very carefully designed, each floor is exactly the same just rotated 1.2° against the previous floor. This design concept forms the 90° spiral around the buildings framework. The Cayan Towers is now home to nearly 500 luxury residential apartments. A sight you must see with your own eyes, the Cayan Towers creates an illusion that the tower is moving regardless of the viewer’s angle. One of the 7-star hotels in Dubai is the Burj Al Arab. Not just one of the most luxurious hotels in the world, the Burj Al Arab is an iconic architectural piece of Dubai. Standing on a man-made island 300m from the Jumeirah coast, the Burj Al Arab is amongst the tallest buildings and the tallest single structure hotels in world. 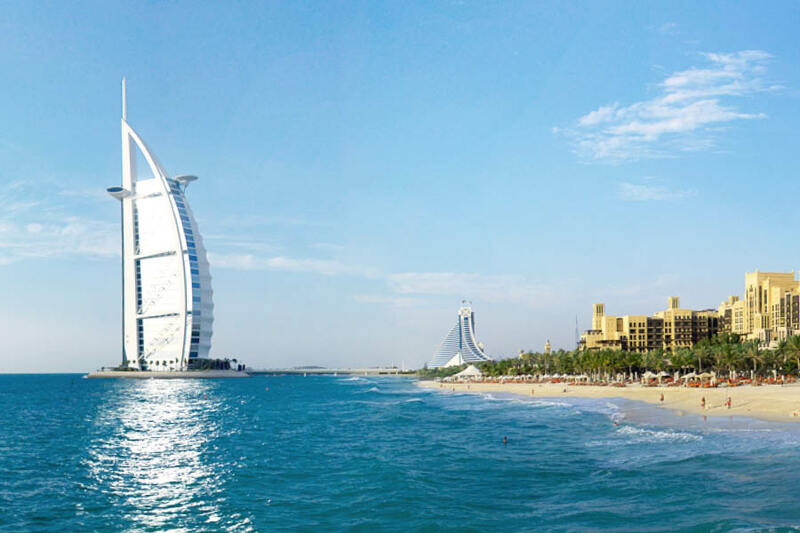 The building is shaped like a modern Arabian sail making Burj Al Arab similar to structures like the Eiffel Tower and Sydney Opera House in that it is a symbol of the region. The building features a rooftop helipad which has hosted a number of celebrity stunts as well as a massive range of dining options including an underwater restaurant! Over 50 species of fish swim in the 3 colossal aquariums and the interior of the building is decorated with 24-carat gold leaf, Swarovski crystals, Brazilian and Italian marble, Dubai wood and wall to ceiling clear glass windows. A visit to Dubai isn’t complete without seeing this magnificent structure with your own eyes. So, it’s not exactly a piece of architecture but it’s still an extremely impressive man-made design. 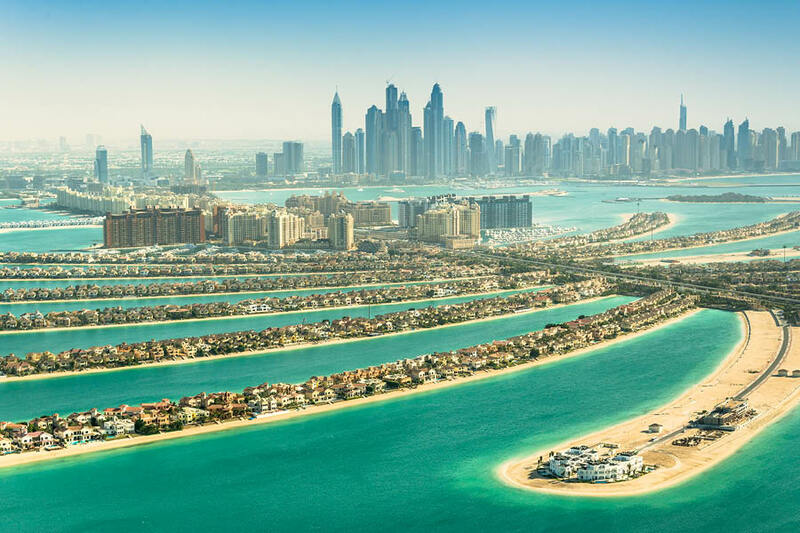 The Palm extends life from the city into the waters of the Arabian Gulf. It’s comprised of a 2km long trunk-like structure, the crown made up for 17 fronds and a crescent shaped island that surrounds it all. The Palm is the largest man-made island in the world and was the first of its kind. The palm shape that the islands create can be seen as your airplane embarks the descend to Dubai and even from the International Space Station! There are over 4,000 luxurious residences on The Palm and those lucky enough to call it home are amongst the wealthy, high status Emirati. High class waterfront living is the heart of The Palm however a visit to this landmark will see a hive of activity. Jump aboard the Palm Monorail to get around the islands; Indulge your taste buds in the extensive range of dining options; Stroll through the 11km boardwalk; Spend a night out at the range of clubs, bars and beach parties; Have a picnic in Al Ittihad Park and shop ‘til you drop at boutiques, stores and malls. The Palm is home to the colossal Atlantis The Palm, with its water park, private beach, dolphin bay, aquarium and labyrinth. Swim with dolphins; Splash your way through the water park, Aquaventure; Walk underwater alongside fish, sharks and rays with the Marine Animal Adventure; Feed cownose rays and relax on the private beach. Get in touch with our Dubai Holiday Experts for more information about the architectural wonders of Dubai!